According to Jon Heyman of CBS Sports, Chase Utley is firmly on the radar of the Los Angeles Dodgers. Heyman states that it is unknown whether or not the Dodgers have contacted the Phillies about Utley and that Ruben Amaro Jr. is not anxious to trade Utley despite the fact that he is headed to free agency. 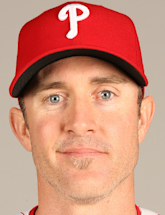 The Phillies would received a compensatory pick for Utley if they made a qualifying offer following the 2013 season whereas the acquiring team would not be afforded the same under the new Collective Bargaining Agreement. From the same Heyman piece, Heyman states that the Phillies will likely attempt to move third baseman Michael Young first. The 36-year old Young has been 2.1 wins more valuable than he was last season (-1.7 fWAR last year to 0.4 this year), hitting .287/.344/.409. Nick Cafardo of the Boston Globe noted again today that Young’s right-handedness and ability to play third base make him an attractive target for the Red Sox. Young will not likely garner a compensatory pick in free agency for the Phillies making a trade a bit more of a slam dunk rather than say, an Utley trade, even though Utley would produce a better return.